Asus ZenBook Pro 14 review: A trackpad that's a touchscreen, how does that work? The ZenBook Pro 14 is the kind of laptop Asus makes every now and then. It's a reactionary response to the MacBook Pro's OLED touch panel. It says "sure, so you can do that, but how about - insert dramatic pause - this?" to Apple, with a look of self-satisfaction. The ZenBook Pro 14's party piece is a glass trackpad that can act like a completely normal touch surface when you want. But turns into a touchscreen display at the press of a button. It's a mini companion tablet, locked right below the keyboard. The best laptop options to buy today? It's only kind-of useful as Asus controls the ZenBook Pro 14's hardware, not the underlying OS. And this is not necessarily the ZenBook model we'd recommend to most people after an everyday laptop either. However, it is unusually versatile, as it squeezes a GTX 1050 Max-Q graphics card into a pretty portable shell. And this is the real hit. The Asus ZenBook Pro 14 is a slim-ish laptop that can behave like a roving PS4 console. How about some work and some play with the addition of an eye-catching and sometimes useful feature? Let's start with the main event: the weirdo trackpad. A lot of the time, you may want to just use it as a normal pad. It's topped with textured glass so feels more-or-less like a standard high-end trackpad. It picks up fingerprint marks more than usual but is not sticky or tacky, and seems much more "trackpad" than "touchscreen", which is definitely what we want. Tap the F6 button, though, and it cycles through two different personalities: ScreenPad and Extension Display. An LCD display under the glass turns on to reveal quite how unusual the ZenBook Pro really is. Extension Display treats this rectangle like a second monitor, using Asus's own custom solution rather than the dual monitor mechanic built into Windows. The same row of shortcut icons on the main display, in miniature form, sits along the bottom. A tool icon to the side lets you fling the current app from the 14-inch screen to the trackpad one. It doesn't seem to work perfectly with all applications, but you can use it to review documents or web pages. Or, if you never want to get any work done, perhaps your Twitter feed or a YouTube video. This is a little like an on-the-go dual monitor setup. The screen is surprisingly high-res too, at Full HD, although as it's relatively small and sharpness is blunted by the textured glass surface, so you won't want to review any big Excel spreadsheets on this little thing... but you can if you want. There's also a control consideration. As standard the pad turns into a touchscreen when using Extension Display you can carry on using it as a touchpad with "cursor" mode, which makes the mouse cursor slip down to the lower screen when you scroll off the bottom - again like a dual monitor setup - but this feels convoluted. The Asus ZenBook Pro 14 is not for novices or the tech-phobic, that's for sure. ScreenPad mode is what Asus really wants you to use, though. It acts like a normal trackpad in this mode, until you flick down from its top. This pulls down a shortcut menu. There's a calculator, a virtual NUM pad, a calendar and music controls for a custom music player. Microsoft Office support is the most important part, though. As little fun as this may sound, the pad makes much more sense when you load up Excel and the wee thing suddenly offers a row of shortcuts to cut down on all the mouse work required for formatting. We do wish it didn't have a bright white background when using Office apps, though. We're after fewer distractions, not more. Word, Excel and Powerpoint get this special treatment. You'll be able to download more ScreenPad widgets from an Asus "store", but these will always be limited unless lots of third-party developers start making ScreenPad widgets for their apps. And why would they, ultimately? The ZenBook Pro's pad is, in some ways, more versatile than Apple's touchbar. But it also comes across as more of an oddball experiment - one that could be amazing with a lot of third-party support. Microsoft Office is, for now, the killer app here. There are a few bugs to sort, mind. A couple of times the Extension Display feature has refused to work, leaving the pad a blank sheet of off-black. Outside of the trackpad, the ZenBook Pro 14 initially seems quite a conventional laptop. It has a metal casing, fairly slim screen borders and Asus's characteristic swirly aluminium lid. It may come across a bit chunky if anything. Where the average slim laptop tapers to a points at the front, the Asus ZenBook Pro 14 does not. It's at risk of seeming dumpy, and is heavier than the slim and light average at 1.6kg. However, in truth it's really, really not when you consider its insides. The ZenBook Pro 14 has an Nvidia GTX 1050 Max-Q graphics card. This isn't quite Alienware-grade hardware, but it can play some very demanding games well. More on that later. You get the sense Asus wants to pack absolutely everything in the ZenBook Pro 14, while still producing a laptop that looks and feels normal when you need it to. A 360-degree hinge is one of the few missing parts. This isn't a hybrid, the screen only flips back to the around the conventional 130-degree mark. Which is fine, we don't all need convertibles. The Asus ZenBook Pro 14 has just one issue beyond sacrifices necessary to fit all the innards in. When opened up, the bottom of the lid sticks out beyond the base. While this is almost certainly done to increase airflow and stop the laptop overheating when playing games, it makes it less comfortable to use when it's on your lap. The ZenBook Pro 14 has a touchscreen display, which works with an active stylus for pressure-sensitive input. You don't get a stylus in the box, which is a shame, but for most it's not an essential accessory anyway. We had one spare for testing out and think it could be smoother - there's a smidge of input lag. But the pressure sensing is handy for sketching, and there's just about enough hinge resistance to let you do so without the screen retreating from stylus. This is a doodling dilettante, sure, but that's the ZenBook Pro 14's whole game. It does a lot of things rather than focusing on a single job. The 14-inch screen could do with a touch more gloss, though. Asus bigs it up by telling us all about its Pantone-calibrated colour gamut. That's all fine, most impressive, but it's the resolution, at Full HD only, that you'll come away noticing. 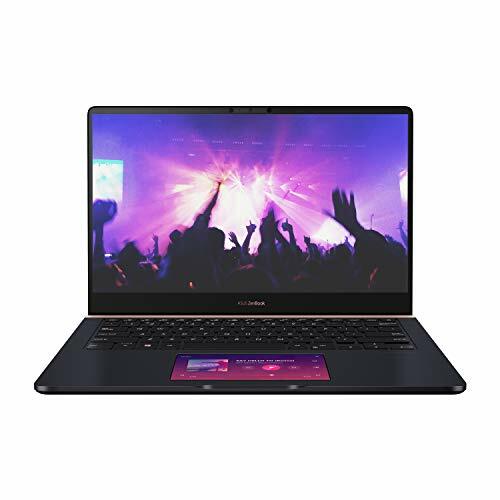 But, hold up, time for a step back: the ZenBook Pro 14, at its selling price, does not "deserve" a 4K screen. But a £100 higher-res upgrade option would be nice. If only the sharpest look will do, check out the 15-inch ZenBook Pro as it does offer a higher-res option. The screen we do get is well saturated, offers solid contrast and punchy brightness. That last point is important because the glossy touch layer makes reflections a potential issue if you use the laptop outdoors. The keyboard is doubly important because we'd happily use the Asus ZenBook Pro 14 as a daily ultraportable. It is just about light enough to feasibly carry around all the time. And while the keyboard predictably isn't a match for a Lenovo ThinkPad, the key travel and action are well-defined and deeper than some. Typing is as at least as comfy as many other top-end style laptops, and the keyboard doesn't flex a millimetre until you apply a ridiculous amount of pressure. So don't do that. The connections are unusually wide-ranging too. You get one USB-C, two full-size USBs, a full-size HDMI and a microSD card slot. One of the larger USBs is a slower USB 2.0 port and the USB-C is not Thunderbolt compatible. But it's more proof the Asus ZenBook Pro 14's aim being breadth, not depth. If you didn't fall in love with trackpad many paragraphs ago, then gaming is where this laptop pays off best. The ZenBook Pro 14 has an Nvidia GTX 1050 Max-Q card. This is a cut-down version of the normal GTX 1050 card, designed to create less heat so it can fit into more cramped spaces. The card you might normally expect to see in a laptop like this is the Nvidia GeForce MX 150. And the GTX 1050, even in its Max-Q form, is about twice as fast. To give it a test run we tried a few games, including The Witcher 3. This may be a few years old now, but gives you a good idea of the kind of games you'll be able to play comfortably. Running the game at 1080p resolution and medium settings the Asus ZenBook Pro 14 hovers around 41-45fps. At high settings this drops to 30-35fps, which is a console-style delivery. Play around with the post-processing, turning off the most "expensive" effects in power terms and you can even play The Witcher 3 at ultra graphics settings without too many regular dips below 28-29fps. This laptop lets you play games at a similar level as a standard Sony PS4 console. And if you're mostly here for work, there's plenty of more conventional power on tap. Our review model has an Intel Core i7-8565U, a high-end quad-core processor for slim and light laptops. Its 8GB RAM and 256GB storage are a good baseline for both the price and most people's needs too. The cheapest Dell XPS 13 with a Core i7 (and currently it's a slightly older-gen chip) is £1319. And that laptop doesn't have discrete graphics or a light-up trackpad. There's enough power in this Asus for video and photo editing, even music production. And when you're just writing documents, the ZenBook Pro 14 is silent - apart some some occasional coil whine you can only hear in a very quiet room. The ZenBook Pro 14 has a 70Wh battery. This is significantly higher capacity than the current Dell XPS 13's, a range once renowned for its battery life. Asus says the Pro lasts 12.5 hours with battery saver mode on and the screen brightness set to 80 per cent. Sounds impressive, right? In our experience, however, using the laptop for a mix of writing and researching on the internet with the screen set to about 20 per cent brightness (it's all you need indoors), saw it last for around nine hours. The "second screen" trackpad display was only turned on for short stints too. This performance is a way off the claim, but you can get much closer if you set the screen brightness to minimum, which is just about usable indoors for the basics, and switch the battery saver mode on. With no browsing, just writing, an hour takes eight per cent off the battery. Voila, there's your 12.5-hour stamina. But it's not how most people will use this ZenBook. Anything else to consider? The Asus ZenBook Pro 14 has no fingerprint scanner for login, which is no great loss considering how well they usually work, but the webcam does have an IR companion for face unlock through Windows Hello. The Harman-branded speakers are solid too, with decent top volume and at least a small amount of bass. We're not even close to MacBook sound quality here, but you don't get the sense the speakers have been neglected completely in favour of the flashy stuff. On paper the Asus ZenBook Pro 14 seems the kind of laptop made as an experiment, for a narrow crowd willing to pay extra for something a bit unusual. It's a surprise, then, that it's actually not badly priced, and can also do more normal things than most competitors too. The proper graphics card makes this a great laptop for travelling gamers, the battery life is solid enough, and while we're not instantly convinced by the trackpad, its tie-in with Microsoft Office makes it much more useful than it would otherwise be. It's a shame the screen at capped at 1080p, and the real enthusiast crowd may well want some faster wired connections. The sheer breadth of the Asus ZenBook Pro 14 is impressive, though, even if it does try to deliver across the board rather than refining itself as champion of one specific area. The obvious, more normal alternative to the ZenBook Pro 14 is the HP Envy 13. It's a couple of hundred cheaper, but doesn't have the unusual light-up trackpad. And its Nvidia MX150 GPU is only half as powerful as the Asus equivalent. At the higher end you get more storage and RAM for your money, though: 16GB and 512GB, respectively. More interested in the gaming side of the ZenBook? The Razer Blade goes a little further, using a GTX 1060 Max-Q in its base spec for even better performance. It is more expensive, though, starting at just under £1500.